Papa roach: Chinese farmer breeds bugs for the table. Beijing: As farmer Li Bingcai opened the door to his cockroach farm in southwest China, an insect the size of a dart flew into his face. Picking the critter off his forehead, he tossed it back into the dark room where some 10 million more of its kind scurried around, housed in wooden frames perched on shelves. The six-legged creatures may be a bugbear for most, but Li and other breeders in China are turning them into a niche business. Some sell cockroaches for medicinal purposes, as animal feed or to get rid of food waste. Li breeds them for something else: food for human consumption. A restaurant down the road from his small facility fries them up in famously spicy Sichuan sauce for the gutsier eaters. 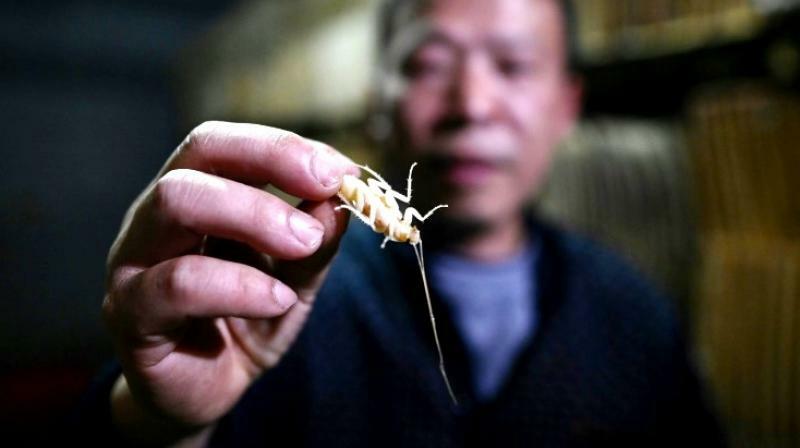 Security is paramount: In 2013, some one million cockroaches escaped a farm in eastern Jiangsu province roamed free after their greenhouse was destroyed. Li's cockroaches live between the spaces of square wooden frames that are held together by pipes and stored in racks lining two rooms. The place is kept warm and humid, leaving a smell reminiscent of damp clothes. Feeding time causes frenzy as Li heaps a mix of ground corn, fruit and vegetable peelings on small trays, the insects suddenly swarm the platforms, crawling over each other. "We breed them in a hygienic environment. They eat proper food nothing synthetic," he said.